Outfit your cheerleader in comfortable, stylish cheerleader apparel. Select trend setting cheerleading uniforms and great mix and match cheer camp clothes. 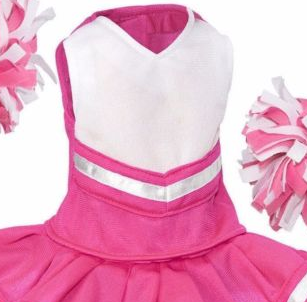 Add coordinating cheerleader pom poms and she's ready to cheer on the team. Metallic shine makes this Reflectionz dance set a perfect choice for girls who are who are passionate dancers or simple amateurs. A tank top by Reflectionz that is sure to highlight her adorable style and her passion for sport and dance. Be a winner with Cheer-leading Apparel from Sophia's Style. With our outstanding selection of quality cheer leading uniforms and cheer camp clothes, great customer service and fast, reliable shipping you can't loose. Don't forget the Pom Poms!